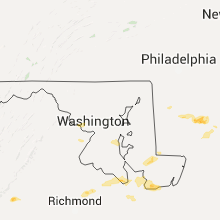 The Floris, VA area has had 1 report of on-the-ground hail by trained spotters, and has been under severe weather warnings 33 times during the past 12 months. Doppler radar has detected hail at or near Floris, VA on 29 occasions, including 4 occasions during the past year. 4/19/2019 8:53 PM EDT At 853 pm edt, a severe thunderstorm capable of producing a tornado was located over reston, moving northeast at 55 mph (radar indicated rotation). Hazards include tornado. For those in the direct path of a tornado touchdown, flying debris will be dangerous to those caught without shelter. damage to roofs, siding, and windows may occur. mobile homes may be damaged or destroyed. Tree damage is likely. 4/19/2019 8:41 PM EDT At 840 pm edt, severe thunderstorms were located along a line extending from near arcola to 6 miles northwest of dale city, moving north at 45 mph (radar indicated). Hazards include 60 mph wind gusts. Damaging winds will cause some trees and large branches to fall. this could injure those outdoors, as well as damage homes and vehicles. roadways may become blocked by downed trees. localized power outages are possible. Unsecured light objects may become projectiles. 4/15/2019 2:10 AM EDT At 210 am edt, severe thunderstorms were located along a line extending from near boyds to near linton hall, moving northeast at 55 mph (radar indicated). Hazards include 60 mph wind gusts. Damaging winds will cause some trees and large branches to fall. this could injure those outdoors, as well as damage homes and vehicles. roadways may become blocked by downed trees. localized power outages are possible. unsecured light objects may become projectiles. Locations impacted include, centreville, reston, south riding, herndon, broadlands, lansdowne, lowes island, brambleton, dulles international airport, ashburn, sterling, chantilly, great falls, countryside, arcola, belmont and sterling park. 12/21/2018 4:35 PM EST The severe thunderstorm warning for southeastern loudoun and central fairfax counties and the city of fairfax will expire at 445 pm est, the storms which prompted the warning have moved out of the area. therefore the warning will be allowed to expire. 12/21/2018 4:30 PM EST At 430 pm est, severe thunderstorms were located along a line extending from leesburg to near centreville, moving east at 45 mph (radar indicated). Hazards include 60 mph wind gusts. Damaging winds will cause some trees and large branches to fall. this could injure those outdoors, as well as damage homes and vehicles. roadways may become blocked by downed trees. localized power outages are possible. unsecured light objects may become projectiles. Locations impacted include, centreville, reston, annandale, springfield, herndon, fairfax, vienna, falls church, broadlands, lansdowne, lowes island, brambleton, mantua, pimmit hills, dulles international airport, ashburn, burke, oakton, sterling and chantilly. 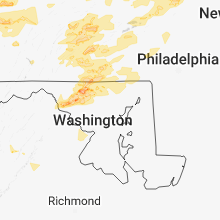 12/21/2018 4:15 PM EST At 415 pm est, severe thunderstorms were located along a line extending from oatlands to 6 miles southeast of linton hall, moving north at 45 mph (radar indicated). Hazards include 60 mph wind gusts. Damaging winds will cause some trees and large branches to fall. this could injure those outdoors, as well as damage homes and vehicles. roadways may become blocked by downed trees. localized power outages are possible. unsecured light objects may become projectiles. Locations impacted include, alexandria, centreville, dale city, reston, annandale, springfield, south riding, herndon, fairfax, fort hunt, vienna, groveton, falls church, broadlands, lansdowne, lowes island, brambleton, mantua, fort belvoir and pimmit hills. 12/21/2018 4:00 PM EST At 400 pm est, severe thunderstorms were located along a line extending from near the plains to 10 miles west of montclair, moving north at 45 mph (radar indicated). Hazards include 60 mph wind gusts. Damaging winds will cause some trees and large branches to fall. this could injure those outdoors, as well as damage homes and vehicles. roadways may become blocked by downed trees. localized power outages are possible. Unsecured light objects may become projectiles. 6/19/2018 2:51 PM EDT The severe thunderstorm warning for southern loudoun, northwestern fairfax, north central fauquier and northwestern prince william counties will expire at 300 pm edt, the storm which prompted the warning has weakened below severe limits, and no longer pose an immediate threat to life or property. therefore the warning will be allowed to expire. 6/19/2018 2:47 PM EDT At 247 pm edt, a severe thunderstorm was located near oatlands, or near brambleton, moving southeast at 35 mph (radar indicated). Hazards include 60 mph wind gusts. Damaging winds will cause some trees and large branches to fall. this could injure those outdoors, as well as damage homes and vehicles. roadways may become blocked by downed trees. localized power outages are possible. unsecured light objects may become projectiles. Locations impacted include, centreville, reston, south riding, herndon, broadlands, brambleton, dulles international airport, ashburn, linton hall, chantilly, bull run, haymarket, middleburg, arcola, oatlands, sudley, gainesville, catharpin, gleedsville and woolsey. 6/19/2018 2:32 PM EDT At 231 pm edt, a severe thunderstorm was located over bluemont, or 12 miles west of leesburg, moving southeast at 35 mph (radar indicated). Hazards include 60 mph wind gusts. Damaging winds will cause some trees and large branches to fall. this could injure those outdoors, as well as damage homes and vehicles. roadways may become blocked by downed trees. localized power outages are possible. Unsecured light objects may become projectiles. 5/14/2018 6:39 PM EDT The tornado warning for southeastern loudoun and northwestern fairfax counties and the northwestern city of fairfax will expire at 645 pm edt, the tornado threat has diminished and the tornado warning has been cancelled. however, large hail and damaging winds remain likely and a severe thunderstorm warning remains in effect for the area. however gusty winds are still possible with this thunderstorm. 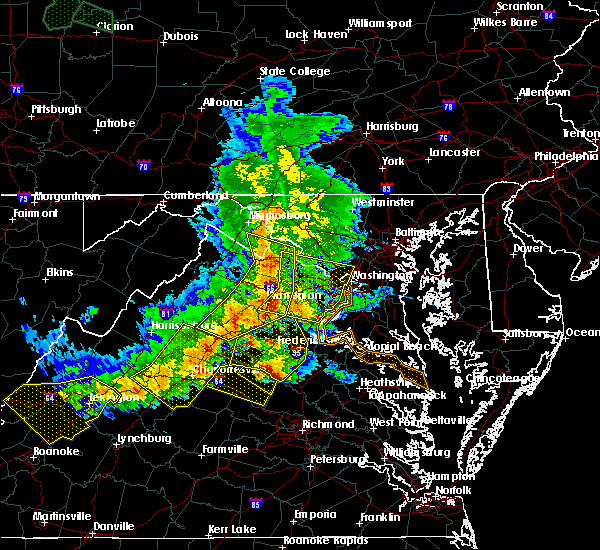 a severe thunderstorm watch remains in effect until 900 pm edt for northern virginia. 5/14/2018 6:28 PM EDT At 627 pm edt, a severe thunderstorm capable of producing a tornado was located over ashburn, or near broadlands, moving southeast at 20 mph (radar indicated rotation). Hazards include tornado and ping pong ball size hail. For those in the direct path of a tornado touchdown, flying debris will be dangerous to those caught without shelter. damage to roofs, siding, and windows may occur. mobile homes may be damaged or destroyed. tree damage is likely. this dangerous storm will be near, chantilly around 635 pm edt. 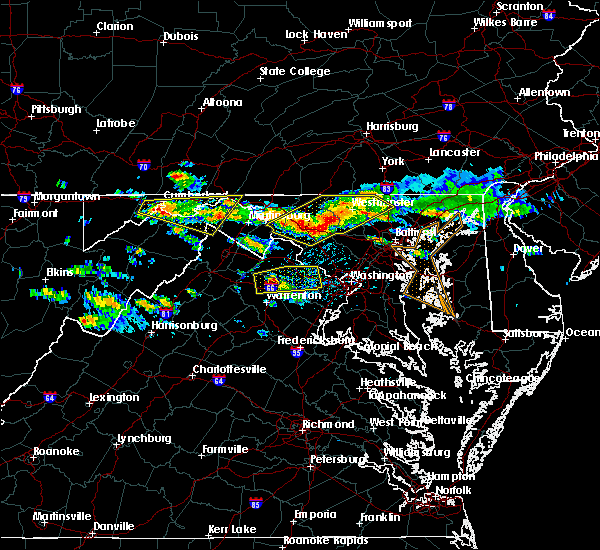 herndon and great falls around 640 pm edt. 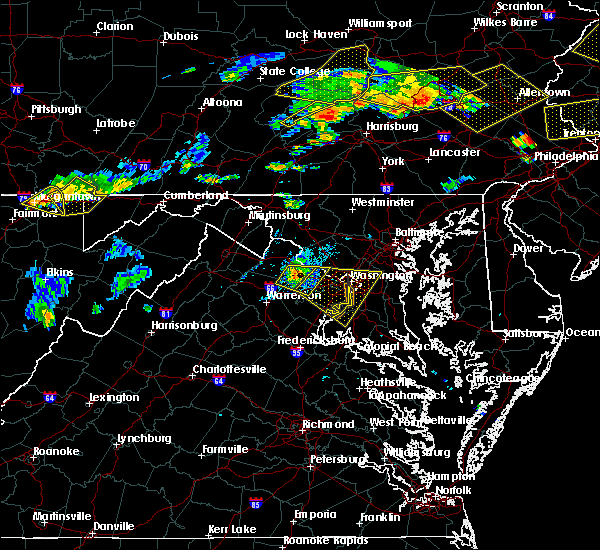 reston, vienna, oakton, tysons corner and wolf trap around 645 pm edt. Other locations impacted by this tornadic thunderstorm include belleview, sterling park and fairfax station. 5/14/2018 6:12 PM EDT At 612 pm edt, a severe thunderstorm capable of producing a tornado was located near leesburg, moving southeast at 20 mph (radar indicated rotation). Hazards include tornado and ping pong ball size hail. For those in the direct path of a tornado touchdown, flying debris will be dangerous to those caught without shelter. damage to roofs, siding, and windows may occur. mobile homes may be damaged or destroyed. tree damage is likely. this dangerous storm will be near, lansdowne around 620 pm edt. broadlands and brambleton around 625 pm edt. arcola around 630 pm edt. ashburn and countryside around 635 pm edt. dulles international airport around 640 pm edt. 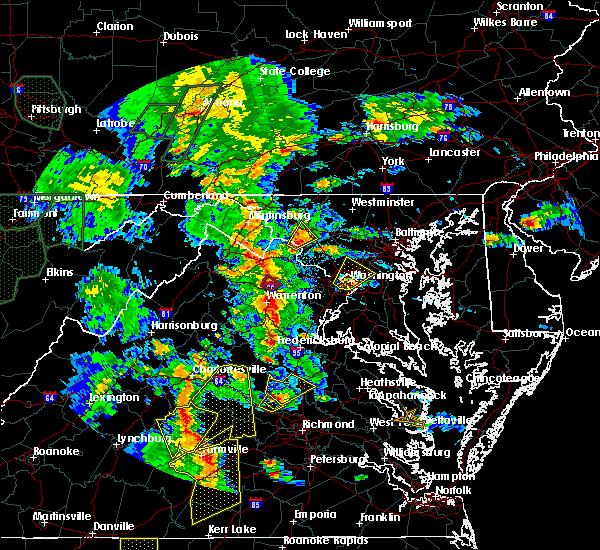 reston, herndon, lowes island, oakton, sterling, chantilly and great falls around 645 pm edt. Other locations impacted by this tornadic thunderstorm include congressional manor, belmont, belleview, sterling park, bradley farms, cabin john and fairfax station. 8/3/2017 7:06 PM EDT At 706 pm edt, a severe thunderstorm was located over centreville, moving north-northeast at 10 mph (radar indicated). Hazards include 60 mph wind gusts. Damaging winds will cause some trees and large branches to fall. this could injure those outdoors, as well as damage homes and vehicles. roadways may become blocked by downed trees. localized power outages are possible. unsecured light objects may become projectiles. Locations impacted include, centreville, reston, south riding, herndon, lansdowne, lowes island, dulles international airport, ashburn, sterling, chantilly, great falls, countryside, belmont and sterling park. 7/14/2017 4:14 PM EDT At 413 pm edt, a severe thunderstorm was located over wolf trap, or over reston, moving southeast at 10 mph (radar indicated). Hazards include 60 mph wind gusts. Damaging winds will cause some trees and large branches to fall. this could injure those outdoors, as well as damage homes and vehicles. roadways may become blocked by downed trees. localized power outages are possible. Unsecured light objects may become projectiles. 7/7/2017 7:40 PM EDT At 739 pm edt, severe thunderstorms were located along a line extending from sterling to near chantilly to near bull run, moving southeast at 35 mph (radar indicated). Hazards include 60 mph wind gusts. Damaging winds will cause some trees and large branches to fall. this could injure those outdoors, as well as damage homes and vehicles. roadways may become blocked by downed trees. localized power outages are possible. Unsecured light objects may become projectiles. 7/1/2017 3:09 PM EDT At 309 pm edt, a severe thunderstorm was located over wolf trap, or over reston, moving east at 30 mph (radar indicated). Hazards include 60 mph wind gusts. Damaging winds will cause some trees and large branches to fall. this could injure those outdoors, as well as damage homes and vehicles. roadways may become blocked by downed trees. localized power outages are possible. unsecured light objects may become projectiles. Locations impacted include, reston, herndon, fairfax, vienna, lowes island, dulles international airport, ashburn, oakton, sterling, chantilly, wolf trap, great falls, countryside, darnestown and sterling park. 6/19/2017 3:11 PM EDT At 311 pm edt, a severe thunderstorm was located near bull run, or near centreville, moving northeast at 40 mph (radar indicated). Hazards include 60 mph wind gusts. Damaging winds will cause some trees and large branches to fall. this could injure those outdoors, as well as damage homes and vehicles. roadways may become blocked by downed trees. localized power outages are possible. unsecured light objects may become projectiles. Locations impacted include, centreville, reston, annandale, springfield, south riding, herndon, fairfax, brambleton, mantua, dulles international airport, ashburn, burke, linton hall, oakton, sterling, chantilly, bull run, haymarket, arcola and manassas. 6/19/2017 2:57 PM EDT At 257 pm edt, a severe thunderstorm was located near haymarket, or near warrenton, moving northeast at 40 mph (radar indicated). Hazards include 60 mph wind gusts and quarter size hail. Damaging winds will cause some trees and large branches to fall. this could injure those outdoors, as well as damage homes and vehicles. roadways may become blocked by downed trees. localized power outages are possible. unsecured light objects may become projectiles. Locations impacted include, centreville, reston, annandale, springfield, south riding, herndon, fairfax, brambleton, mantua, dulles international airport, ashburn, burke, linton hall, oakton, sterling, chantilly, bull run, haymarket, arcola and manassas. 6/19/2017 2:45 PM EDT At 244 pm edt, a severe thunderstorm was located over warrenton, moving northeast at 40 mph (radar indicated). Hazards include 60 mph wind gusts and quarter size hail. Damaging winds will cause some trees and large branches to fall. this could injure those outdoors, as well as damage homes and vehicles. roadways may become blocked by downed trees. localized power outages are possible. Unsecured light objects may become projectiles. 5/31/2017 5:25 PM EDT At 525 pm edt, a severe thunderstorm was located over sterling, or over herndon, moving northeast at 25 mph (radar indicated). Hazards include 60 mph wind gusts and quarter size hail. Damaging winds will cause some trees and large branches to fall. this could injure those outdoors, as well as damage homes and vehicles. roadways may become blocked by downed trees. localized power outages are possible. unsecured light objects may become projectiles. Locations impacted include, centreville, bethesda, reston, south riding, herndon, lowes island, brambleton, dulles international airport, potomac, north bethesda, ashburn, oakton, sterling, north potomac, chantilly, wolf trap, great falls, countryside, arcola and darnestown. 5/31/2017 5:12 PM EDT At 512 pm edt, a severe thunderstorm was located over dulles international airport, moving northeast at 25 mph (radar indicated). Hazards include 60 mph wind gusts. Damaging winds will cause some trees and large branches to fall. this could injure those outdoors, as well as damage homes and vehicles. roadways may become blocked by downed trees. localized power outages are possible. Unsecured light objects may become projectiles. 5/18/2017 7:39 PM EDT At 739 pm edt, severe thunderstorms were located along a line extending from near dulles international airport to near haymarket, moving southeast at 25 mph (radar indicated). Hazards include 60 mph wind gusts and half dollar size hail. Damaging winds will cause some trees and large branches to fall. this could injure those outdoors, as well as damage homes and vehicles. roadways may become blocked by downed trees. localized power outages are possible. Unsecured light objects may become projectiles. 4/6/2017 1:26 PM EDT At 126 pm edt, a severe thunderstorm capable of producing a tornado was located near warrenton, moving northeast at 45 mph (radar indicated rotation). Hazards include tornado. For those in the direct path of a tornado touchdown, flying debris will be dangerous to those caught without shelter. damage to roofs, siding, and windows may occur. mobile homes may be damaged or destroyed. tree damage is likely. this dangerous storm will be near, linton hall around 135 pm edt. south riding around 145 pm edt. 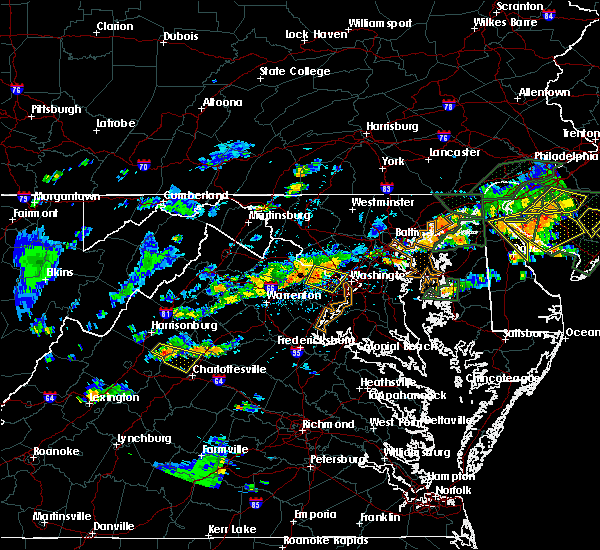 centreville, brambleton, dulles international airport, chantilly and arcola around 150 pm edt. 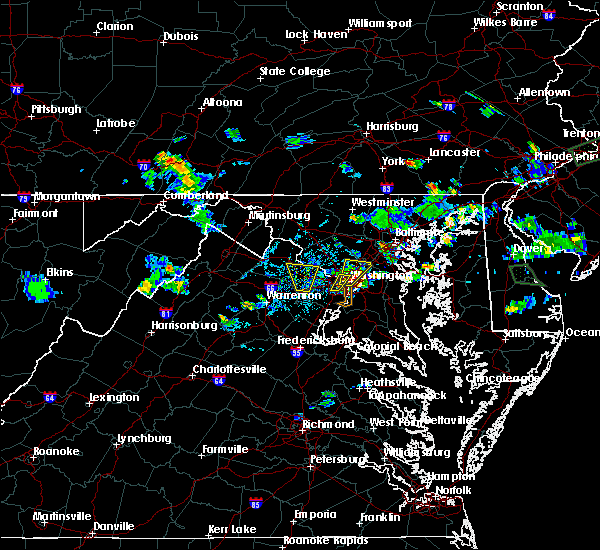 broadlands around 155 pm edt. reston, herndon, lansdowne, lowes island, ashburn, sterling, great falls and countryside around 200 pm edt. Other locations impacted by this tornadic thunderstorm include catharpin, garrett park, derwood, clarksburg, woolsey, washington grove, belmont, belleview, bradley farms and kensington. 6/28/2016 4:46 PM EDT At 446 pm edt, a severe thunderstorm was located over middleburg, or 12 miles west of brambleton, moving southeast at 25 mph (radar indicated). Hazards include 60 mph wind gusts and quarter size hail. Damaging winds will cause some trees and large branches to fall. this could injure those outdoors, as well as damage homes and vehicles. roadways may become blocked by downed trees. localized power outages are possible. Unsecured light objects may become projectiles. 6/21/2016 5:47 PM EDT At 547 pm edt, a severe thunderstorm was located near fairfax, moving east at 25 mph (radar indicated). Hazards include 60 mph wind gusts. Damaging winds will cause some trees and large branches to fall. this could injure those outdoors, as well as damage homes and vehicles. roadways may become blocked by downed trees. localized power outages are possible. unsecured light objects may become projectiles. Locations impacted include, arlington, alexandria, centreville, reston, annandale, springfield, fairfax, fort hunt, vienna, groveton, falls church, huntington, mantua, fort belvoir, pimmit hills, crystal city, reagan national airport, mclean, rosslyn and burke. 6/21/2016 5:39 PM EDT The severe thunderstorm warning for northwestern fairfax and southeastern loudoun counties will expire at 545 pm edt, the storm which prompted the warning has moved out of the area. therefore the warning will be allowed to expire. a severe thunderstorm watch remains in effect until 900 pm edt for northern virginia. 6/21/2016 5:37 PM EDT At 536 pm edt, a severe thunderstorm was located over chantilly, or near centreville, moving east at 25 mph (radar indicated). Hazards include 60 mph wind gusts and quarter size hail. Damaging winds will cause some trees and large branches to fall. this could injure those outdoors, as well as damage homes and vehicles. roadways may become blocked by downed trees. localized power outages are possible. unsecured light objects may become projectiles. 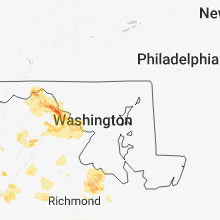 Locations impacted include, arlington, alexandria, centreville, reston, annandale, springfield, fairfax, fort hunt, vienna, groveton, falls church, huntington, mantua, fort belvoir, pimmit hills, crystal city, reagan national airport, mclean, rosslyn and burke. 6/21/2016 5:34 PM EDT At 534 pm edt, a severe thunderstorm was located over south riding, moving southeast at 25 mph (radar indicated). Hazards include 60 mph wind gusts. Damaging winds will cause some trees and large branches to fall. this could injure those outdoors, as well as damage homes and vehicles. roadways may become blocked by downed trees. localized power outages are possible. unsecured light objects may become projectiles. Locations impacted include, centreville, reston, south riding, herndon, brambleton, dulles international airport, ashburn, sterling, chantilly, arcola, sudley and sterling park. 6/21/2016 5:31 PM EDT At 531 pm edt, a severe thunderstorm was located over south riding, moving southeast at 25 mph (radar indicated). Hazards include 70 mph wind gusts and half dollar size hail. Damaging winds will cause some trees and large branches to fall. this could injure those outdoors, as well as damage homes and vehicles. roadways may become blocked by downed trees. localized power outages are possible. Unsecured light objects may become projectiles. 6/21/2016 5:21 PM EDT At 521 pm edt, a severe thunderstorm was located near oatlands, or near brambleton, moving southeast at 25 mph (radar indicated). Hazards include 70 mph wind gusts and half dollar size hail. Damaging winds will cause some trees and large branches to fall. this could injure those outdoors, as well as damage homes and vehicles. roadways may become blocked by downed trees. localized power outages are possible. unsecured light objects may become projectiles. Locations impacted include, centreville, reston, south riding, herndon, broadlands, brambleton, dulles international airport, ashburn, sterling, chantilly, bull run, arcola, oatlands, sudley, woolsey, gleedsville, aldie, catharpin, halfway and sterling park. 6/21/2016 5:15 PM EDT At 515 pm edt, a severe thunderstorm was located over middleburg, or 8 miles west of brambleton, moving southeast at 25 mph (radar indicated). Hazards include golf ball size hail and 60 mph wind gusts. Expect wind damage to trees and power lines. hail is large enough to dent and damage vehicles. some hail damage to roofs, siding, and windows is possible. Locations impacted include, centreville, reston, south riding, herndon, broadlands, brambleton, dulles international airport, ashburn, sterling, chantilly, bull run, middleburg, arcola, oatlands, sudley, woolsey, philomont, gleedsville, aldie and catharpin. 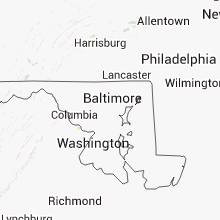 6/21/2016 4:53 PM EDT At 453 pm edt, a severe thunderstorm was located near bluemont, or 16 miles south of charles town, moving southeast at 25 mph (radar indicated). Hazards include golf ball size hail and 70 mph wind gusts. Expect wind damage to trees and power lines. hail is large enough to dent and damage vehicles. Some hail damage to roofs, siding, and windows is possible. 6/21/2016 3:38 PM EDT At 336 pm edt, a severe thunderstorm was located over centreville, moving southeast at 30 mph (radar indicated). Hazards include 75 mph wind gusts and half dollar size hail. This is a particularly dangerous situation. residents in and near centreville should move to safe shelter indoors away from windows immediately. damaging winds will cause some trees and large branches to fall. this could injure those outdoors, as well as damage homes and vehicles. roadways may become blocked by downed trees. localized power outages are possible. unsecured light objects may become projectiles. Locations impacted include, alexandria, centreville, dale city, reston, annandale, springfield, south riding, fairfax, fort hunt, vienna, groveton, huntington, mantua, fort belvoir, woodbridge, quantico, dulles international airport, lake ridge, burke and oakton. 6/21/2016 3:33 PM EDT At 332 pm edt, a severe thunderstorm was located over chantilly, or over centreville, moving southeast at 30 mph (radar indicated. golf ball size hail has been reported 1 mile south of dulles airport at 330 pm). Hazards include golf ball size hail and 70 mph wind gusts. Expect wind damage to trees and power lines. hail is large enough to dent and damage vehicles. some hail damage to roofs, siding, and windows is possible. Locations impacted include, alexandria, centreville, dale city, reston, annandale, springfield, south riding, fairfax, fort hunt, vienna, groveton, huntington, mantua, fort belvoir, woodbridge, quantico, dulles international airport, lake ridge, burke and oakton. 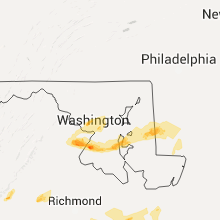 6/21/2016 3:27 PM EDT At 327 pm edt, a severe thunderstorm was located over chantilly, or over south riding, moving southeast at 30 mph (radar indicated). Hazards include 70 mph wind gusts and quarter size hail. Damaging winds will cause some trees and large branches to fall. this could injure those outdoors, as well as damage homes and vehicles. roadways may become blocked by downed trees. localized power outages are possible. Unsecured light objects may become projectiles. 6/21/2016 3:07 PM EDT At 307 pm edt, a severe thunderstorm was located near middleburg, or 9 miles west of brambleton, moving southeast at 35 mph (radar indicated). Hazards include 60 mph wind gusts and quarter size hail. Damaging winds will cause some trees and large branches to fall. this could injure those outdoors, as well as damage homes and vehicles. roadways may become blocked by downed trees. localized power outages are possible. unsecured light objects may become projectiles. Locations impacted include, centreville, reston, south riding, herndon, broadlands, brambleton, dulles international airport, ashburn, linton hall, sterling, chantilly, bull run, haymarket, middleburg, arcola, oatlands, sudley, gainesville, woolsey and gleedsville. 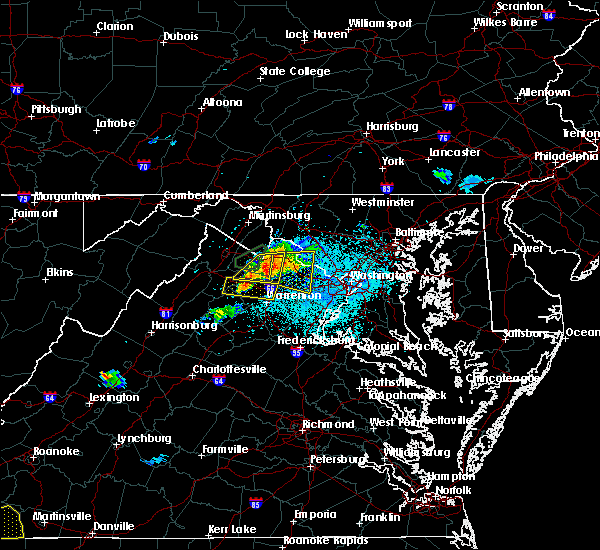 6/21/2016 2:54 PM EDT At 254 pm edt, a severe thunderstorm was located over bluemont, or 13 miles south of charles town, moving southeast at 35 mph (radar indicated). Hazards include 60 mph wind gusts and quarter size hail. Damaging winds will cause some trees and large branches to fall. this could injure those outdoors, as well as damage homes and vehicles. roadways may become blocked by downed trees. localized power outages are possible. Unsecured light objects may become projectiles. 6/21/2016 1:52 PM EDT The severe thunderstorm warning for northwestern fairfax, northern prince william and southeastern loudoun counties will expire at 200 pm edt, the storm which prompted the warning has weakened, and no longer pose an immediate threat to life or property. therefore the warning will be allowed to expire. 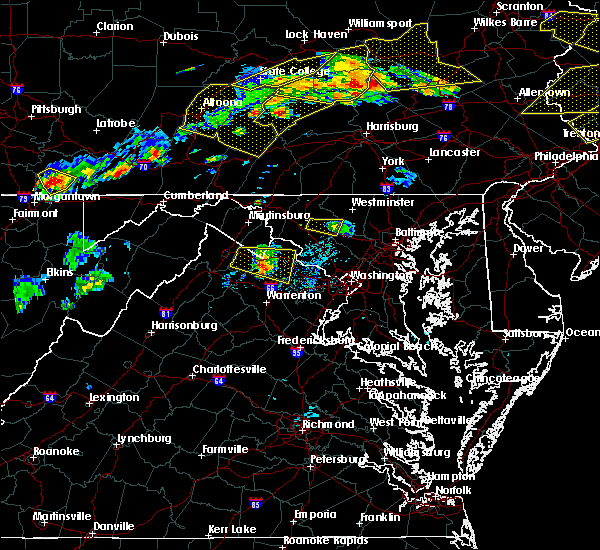 a severe thunderstorm watch remains in effect until 900 pm edt for central maryland, and northern virginia. to report severe weather, contact your nearest law enforcement agency. they will relay your report to the national weather service sterling virginia. 6/21/2016 1:41 PM EDT At 141 pm edt, a severe thunderstorm was located over herndon, moving east at 40 mph (radar indicated). Hazards include 70 mph wind gusts and quarter size hail. Damaging winds will cause some trees and large branches to fall. this could injure those outdoors, as well as damage homes and vehicles. roadways may become blocked by downed trees. localized power outages are possible. unsecured light objects may become projectiles. Locations impacted include, centreville, reston, south riding, herndon, fairfax, broadlands, lowes island, brambleton, dulles international airport, ashburn, oakton, sterling, chantilly, wolf trap, great falls, countryside, arcola and sterling park. 6/21/2016 1:26 PM EDT At 126 pm edt, a severe thunderstorm was located near aldie, or near brambleton, moving east at 40 mph. this is a very dangerous storm (radar indicated). Hazards include 80 mph wind gusts and two inch hail. Expect considerable damage to trees and power lines. you life is at significant risk if outdoors. in addition to some trees falling into homes, wind damage is possible to roofs, sheds, open garages, and mobile homes. Locations impacted include, centreville, reston, south riding, herndon, fairfax, broadlands, lowes island, brambleton, dulles international airport, ashburn, oakton, sterling, chantilly, wolf trap, great falls, countryside, arcola, oatlands, belmont and woolsey. 6/21/2016 1:16 PM EDT At 116 pm edt, a severe thunderstorm was located near middleburg, or 10 miles west of brambleton, moving east at 40 mph (radar indicated). Hazards include two inch hail and 70 mph wind gusts. Expect wind damage to trees and power lines. hail is large enough to dent and damage vehicles. some hail damage to roofs, siding, and windows is possible. Locations impacted include, centreville, reston, south riding, herndon, fairfax, broadlands, lowes island, brambleton, dulles international airport, ashburn, oakton, sterling, chantilly, wolf trap, great falls, countryside, middleburg, arcola, the plains and oatlands. 6/21/2016 1:12 PM EDT At 112 pm edt, doppler radar indicated a severe thunderstorm capable of producing quarter size hail and destructive winds in excess of 70 mph. 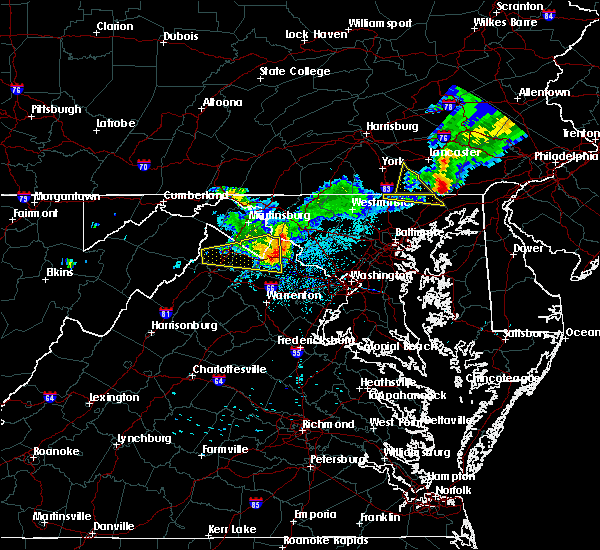 this storm was located near middleburg, or 13 miles west of brambleton, and moving east at 40 mph. 5/2/2016 6:31 PM EDT At 630 pm edt, a severe thunderstorm was located over wolf trap, or over vienna, moving northeast at 25 mph (radar indicated). Hazards include 60 mph wind gusts and half dollar size hail. Expect wind damage to roofs. siding. and trees. Locations impacted include, arlington, bethesda, reston, annandale, herndon, fairfax, vienna, falls church, mantua, pimmit hills, mclean, american legion bridge, potomac, oakton, tysons corner, wolf trap, great falls, merrifield, lake barcroft and ballston. 5/2/2016 6:15 PM EDT At 614 pm edt, doppler radar indicated a severe thunderstorm capable of producing quarter size hail and damaging winds in excess of 60 mph. this storm was located over chantilly, or near fairfax, and moving northeast at 25 mph. 7/1/2015 12:49 AM EDT At 1248 am edt, doppler radar indicated a severe thunderstorm capable of producing quarter size hail and damaging winds in excess of 60 mph. this storm was located near dale city, moving northeast at 30 mph. locations impacted include, dale city, centreville, lake ridge, chantilly, burke, montclair, newington, bull run, manassas, manassas park, west springfield, aden, fairfax station, clifton, independent hill, sudley and north springfield. 7/1/2015 12:33 AM EDT At 1233 am edt, doppler radar indicated a severe thunderstorm capable of producing quarter size hail and damaging winds in excess of 60 mph. this storm was located 10 miles west of montclair, or 10 miles west of dale city, and moving northeast at 30 mph. 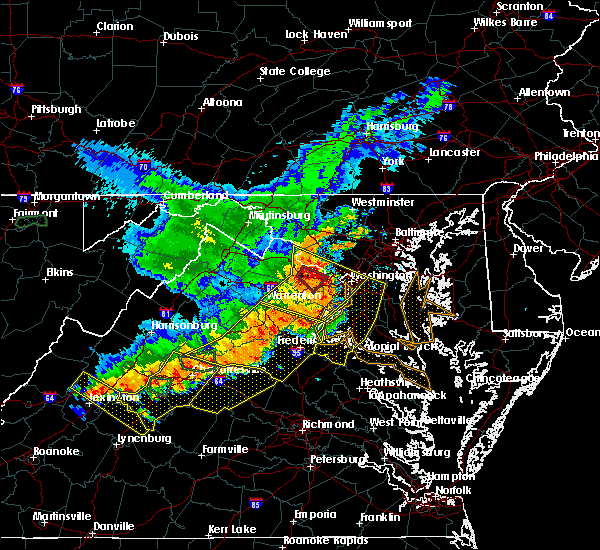 6/20/2015 7:54 PM EDT The severe thunderstorm warning for northern spotsylvania, stafford, west central fairfax, prince william, eastern fauquier, southeastern loudoun and eastern culpeper counties, the city of manassas and the city of manassas park will expire at 800 pm edt, the storms which prompted the warning have moved out of the area. therefore the warning will be allowed to expire. 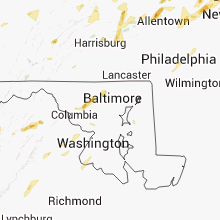 6/20/2015 7:48 PM EDT At 748 pm edt, doppler radar indicated a line of severe thunderstorms capable of producing damaging winds in excess of 60 mph. these storms were located along a line extending from broadlands to near bull run to 6 miles northwest of fredericksburg, and moving east at 25 mph. 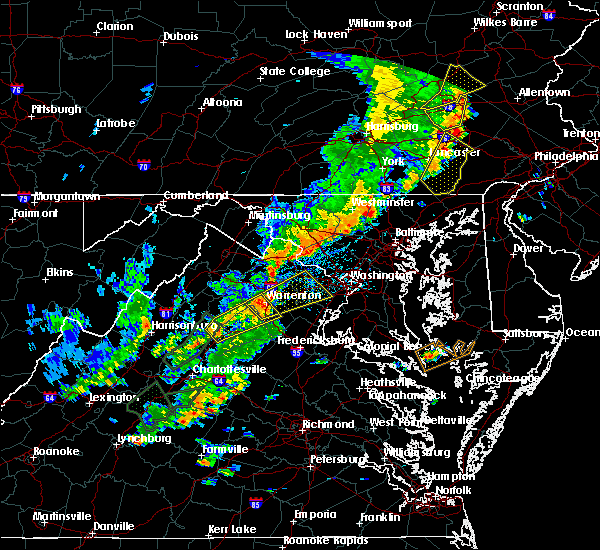 6/20/2015 7:21 PM EDT At 721 pm edt, doppler radar indicated a line of severe thunderstorms capable of producing damaging winds in excess of 60 mph. these storms were located along a line extending from near arcola to near spotsylvania, and moving east at 30 mph. 6/18/2015 4:57 PM EDT At 456 pm edt, doppler radar indicated a line of severe thunderstorms capable of producing large damaging hail up to golf ball size and destructive winds in excess of 70 mph. these storms were located along a line extending from near arcola to chantilly to wolf trap. these storms were nearly stationary. 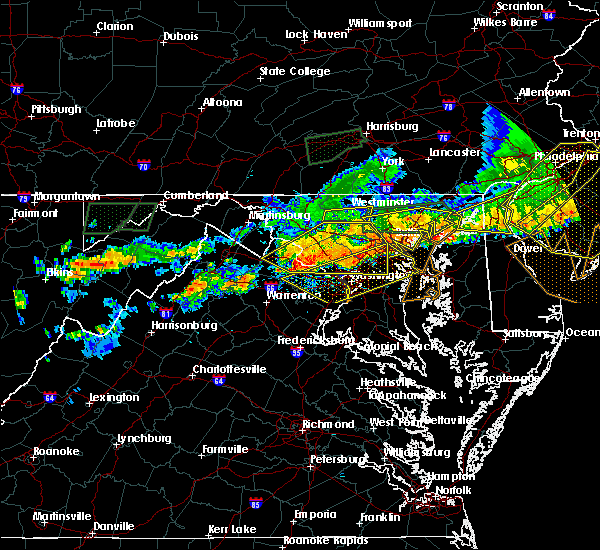 in addition, a wind gust to 64 mph was recorded at dulles airport with these storms. take cover immediately! locations impacted include, fairfax, vienna, falls church, reston, south riding, pimmit hills, mantua, dulles international airport, annandale, centreville, lake barcroft, tysons corner, merrifield, i66 and i495 interchange, chantilly, wolf trap, bull run, oakton, arcola and burke. 6/18/2015 4:48 PM EDT At 448 pm edt, doppler radar indicated a line of severe thunderstorms capable of producing large hail up to ping pong ball size and damaging winds in excess of 60 mph. these storms were located along a line extending from near arcola to chantilly to wolf trap, and moving south at 20 mph. 6/18/2015 4:44 PM EDT At 444 pm edt, doppler radar indicated a line of severe thunderstorms capable of producing quarter size hail and damaging winds in excess of 60 mph. these storms were located along a line extending from countryside to dulles international airport to arcola, moving southeast at 20 mph. locations impacted include, herndon, reston, south riding, lowes island, brambleton, dulles international airport, centreville, countryside, sterling, arcola, chantilly, great falls, wolf trap and sterling park. 6/8/2015 6:59 PM EDT At 658 pm edt, doppler radar indicated a severe thunderstorm capable of producing quarter size hail and damaging winds in excess of 60 mph. this storm was located over chantilly, or near dulles international airport, moving east at 45 mph. locations impacted include, herndon, fairfax, vienna, springfield, reston, south riding, brambleton, mantua, dulles international airport, annandale, centreville, haymarket, merrifield, i66 and i495 interchange, chantilly, wolf trap, i395 and i495 interchange, oakton, arcola and tysons corner. a tornado watch remains in effect until 800 pm edt for northern virginia. 6/8/2015 6:43 PM EDT At 643 pm edt, doppler radar indicated a severe thunderstorm capable of producing quarter size hail and damaging winds in excess of 60 mph. this storm was located near haymarket, or 9 miles west of south riding, and moving east at 45 mph. 5/6/2015 3:44 PM EDT At 343 pm edt, doppler radar indicated a severe thunderstorm capable of producing large damaging hail up to golf ball size. this storm was located over chantilly, or just north of centreville, and drifting southeast at 5 mph. a second storm capable of producing nickel size hail was located near reston, and also drifting southeast at 5 mph. quarter to golf ball size hail has been reported near chantilly. dime to nickel size hail has been reported in reston. locations impacted include, fairfax, vienna, reston, centreville, mantua, i66 and i495 interchange, annandale, oakton, merrifield, chantilly, wolf trap, burke, tysons corner, ravensworth, dunn loring, fairfax station, clifton, north springfield and west springfield. 5/6/2015 3:39 PM EDT At 338 pm edt, doppler radar indicated a severe thunderstorm capable of producing large damaging hail up to golf ball size. this storm was located over chantilly, or just north of centreville, moving southeast at 5 mph. quarter to golf ball sized hail was reported in chantilly with this storm. seek shelter now. locations impacted include, fairfax, vienna, reston, centreville, mantua, i66 and i495 interchange, annandale, oakton, merrifield, chantilly, wolf trap, burke, tysons corner, ravensworth, dunn loring, fairfax station, clifton, north springfield and west springfield. 5/6/2015 3:19 PM EDT At 318 pm edt, doppler radar indicated a severe thunderstorm capable of producing half dollar size hail. this storm was located over chantilly. this storm was nearly stationary.